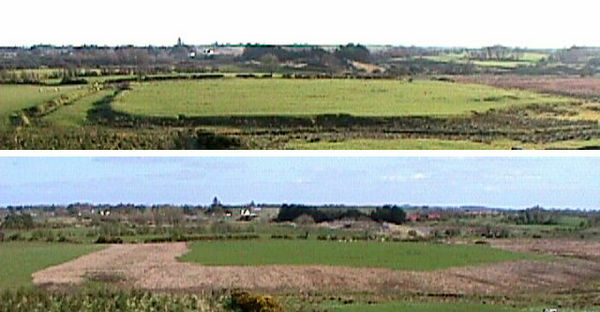 Belafea "buaile" (cattle kraal NE of Turoe before (top)/after (lower) demolition, between Grange Hill ("grainsech" = granary) & Knocknabuaile. Sli Mor ran on the Escir Riada on the far boundary. Two other adjacent "buaile" survive, one, Boley-more, to the SE, and another, 'moated site', in Rathglass, east of Rahally Hillfort. All 3 were brought into Turoe's Fir Belg defensive system.